Horn Grip - A trumpet players best Friend! Improves Endurance, Dexterity & Finger Speed in your right hand. Develop the lightening fast fingers you've been dreaming of. Designed by Chris Cromer and John Wheeler. Precision made in the USA by Warburton. The Horn Grip works by supporting the right hand in the correct position for efficient operation of the trumpet valves. Breaking the habit of poor right hand posture can be difficult. The Horn Grip makes it easy by providing a constant reminder of proper hand position, which in turn promotes more efficient valve operation and reduced fatigue. Adjust the lateral size to achieve a comfortable distance for the Grip body from the lead pipe to your right palm. Adjust this by turning the 2 shorter lead pipe posts attached to the body in or out while ensuring that the ending position of each post allows the curvature machined into the head of each post to cradle the matching curve of the face of the lead pipe. Mount the Grip body on your lead pipe using the velcro straps attached to the posts by looping them around the back of the lead pipe & securing the velcro to itself. Insert the 2 longer support legs into the body while adjusting them to the desired distance to fit your hand & horn size vertically. While adjusting the legs into position keep in mind the foot of each leg is designed to rest on the center valve casing braces located just below the casing balusters. Once the desired length is achieved lock each leg size in place using the 2 knurled nuts provided on each leg by turning them into each other (similar to a Bach style 3rd valve slide stop rod assembly). STORAGE: When you need to put your horn in the case you can quickly & easily stow the Grip body away without removing the velcro straps. Simply remove the longer support legs by unscrewing them while keeping the lock nuts in place & then swing the Grip body under the lead pipe while keeping it attached to the lead pipe with the straps. Since you've already "set" the depth of each leg with the 2 lock nuts you can now easily remove/reattach the support legs without losing your chosen size settings. 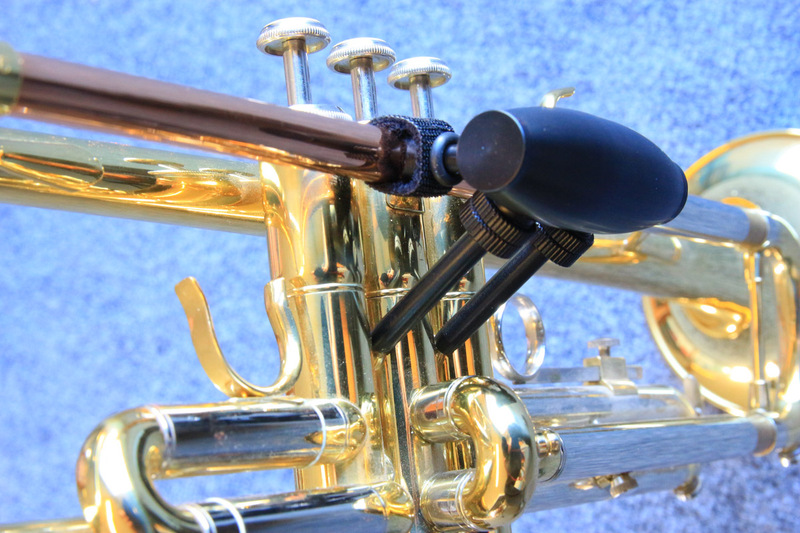 The detached support legs can be easily stored in a mouthpiece pouch or accessory pocket of your trumpet case/gig bag. Note: For players who prefer to place their right hand on their instrument while resting the tip of your thumb between the 1st & 2nd valve casing balusters, you can remove the left support leg of the Grip during use as the body is able to be fully supported & maintain full functionality with only the right leg in place.